Charcoal briquettes are an easy concept to understand: Light them up, then, after they burn down, add more. On the other hand, no one really knows what’s going on inside a propane tank. The Refuel gauge aims to solve that with a scale that displays how much fuel is left in the tank by weighing it, then sending that data to Quirky’s Wink app on your iPhone or Android smartphone. We used Refuel recently when smoking a 5-pound pork shoulder for nearly three hours — the grilling equivalent of a marathon. 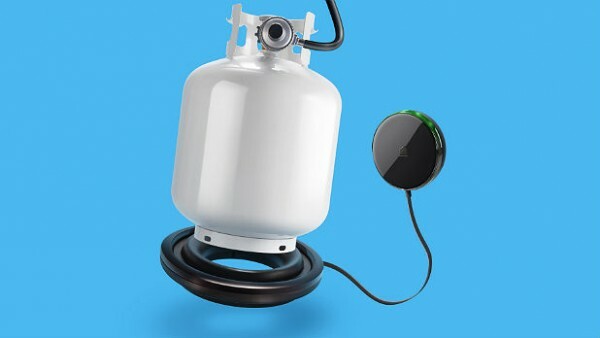 Refuel’s spring-loaded scale accepts most 20-pound tanks and runs a 4-foot weather- and heat-resistant cord that connects to the magnetic sensor. Once it syncs with Wink and you enter the weight of the tank (it’s stamped onto the handle), it displays the remaining amount of fuel. Syncing the sensor to the app requires having both within range of your network. During our test, we had to roll our grill a bit closer to the house than we were comfortable with. Like a lot of grills, ours is covered with swaths of stainless steel, so finding a convenient spot for the magnetic sensor wasn’t easy either. But once the app was up and running, things went smoothly. About an hour into the smoking session, we were notified that our fuel dropped to a quarter-tank through a push notification we set up through Wink (it can also email). When we were outside, away from our phone, a quick tap of the sensor prompted a series of lights to indicate how much fuel was left. We pulled the pork off to finish it in the oven for a couple more hours, and the reward was a nice pink smoke ring and beautifully-scented shreds of pork. While the system is simple to use, many high-end grills, including ours, already have a scale system built in. There are also some apps that do the same by listening to the tank as you tap it, though weight is going to be a more accurate representation.